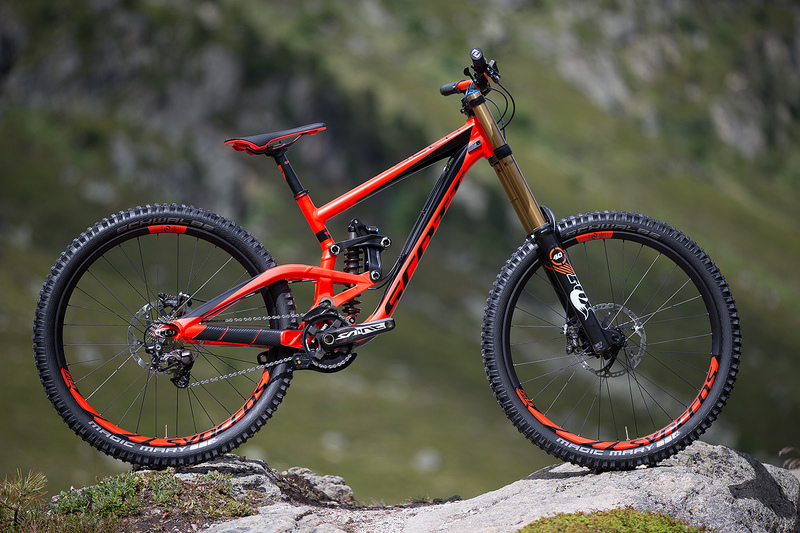 Ahead of the curve when it came to offering big wheels on its trail bikes, now Scott's Gambler and Voltage go 650b. It was always a matter of when, not if, Scott would introduce 650b wheels to its gravity range. For 2015, both the Voltage and Gambler are redesigned to accomodate bigger wheels. The Gambler may share similar aesthetics to its predecessor but it has, in fact, been completely redesigned. Scott was one of the first brands to experiment with 650b wheels on the World Cup circuit. The new Gambler is the culmination of a year of testing on both the race track and ski resorts across the Alps. In conjunction with the adjustable geometry, it’s possible to run either 26in or 650b wheels with almost the same geometry. Riders can choose to run different wheelsizes for different race tracks, or simply upgrade their current frame without needing to buy new wheels, tyres and fork. Despite the compatibility with 650b wheels, the new Gambler retains the same chainstay length and 210mm rear wheel travel as its predecessor, but gains a slightly lower bottom bracket. The Gambler is one of the most adjustable downhill bikes on the market. Riders can tune chainstay length, bottom bracket height, wheelbase and head angle to give a wide window of geometry. The rear axle keys into the IDSX dropouts to give either 425mm or 440mm chainstay lengths. A range of Syncros headset cups allow a head angle of between 61° and 65°. Further adjustment is possible using the fork crowns. By rotating the lower shock mount 180° it is possible to raise or lower the bottom bracket height by 10mm. Such freedom to play with set-up means that the Gambler can be adapted to suit a wide variety of riders and race tracks. Use of the Floating Link allows Scott to keep the huge, 10.5in eye-to-eye, 3.5in stroke, Fox RC4 shock centred in the frame and manipulate the leverage curve. Bushing rotation is further reduced over the previous Gambler frame, improving sensitivity and increasing bushing life. The new Gambler is 6% stiffer at the head tube and 15% stiffer at the bottom bracket. 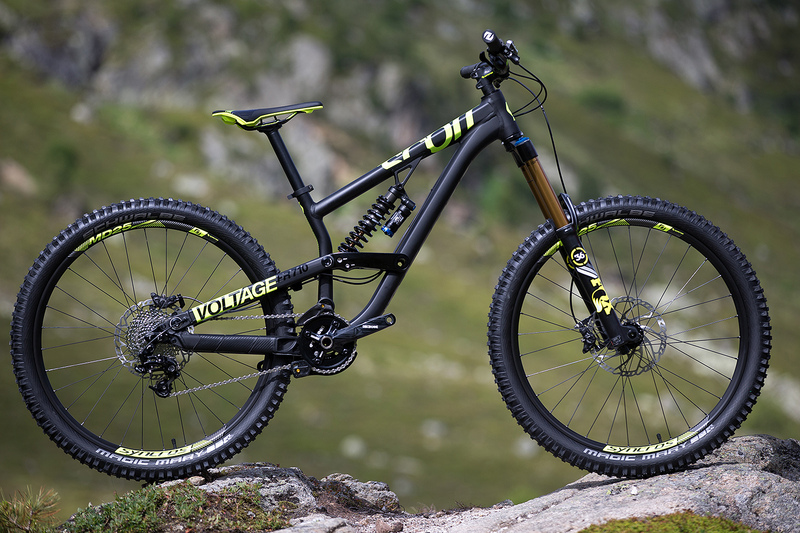 Scott’s bike park/freeride/slopestyle/mini-DH bike is a popular machine in alpine areas, both for ski resort hire fleets and riders looking for an affordable workhorse. Completely redesigned for 2015, the new Voltage gets major geometry updates and compatibility with the latest wheel size. With variable travel and adjustable geometry, the Voltage can be run with either 26in or 650b wheels. Flip the shock mount and the Voltage FR gives you either 190mm or 170mm of travel. IDSX dropouts allow you to tune the chainstay length between 410mm and 425mm, although the former will only work with 26in wheels. The same Syncros headset cups used on the Gambler allow a head angle adjustment between 62° and 66°. Compared to the previous Voltage FR, head tube stiffness is up 26% and bottom bracket stiffness a whopping 41%.